The town of Chignin with Mont Grainer in the distance Savoie lies in the foothills of the Alps, mostly between Lake Geneva and Chambéry. From Lyon to Chambéry, it is about an hour and a half drive on the autoroute. 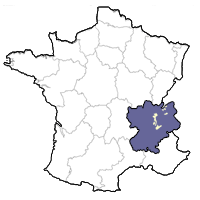 Chambéry is the largest city in the area, and therefore its center. Not much wine leaves Savoie. 99% is consumed in the region, generally by tourists who come to hike or cycle in the mountains in the summer and ski in the winter. The grapes include Jacquère, Roussette (also known as Altesse),Chasselas, and Bergeron (also known as Roussanne) for the whites, and Mondeuse (the king of red grapes in the alps), Pinot Noir and Gamay for the reds. Savoie has a long history of producing wine. Documentation of grape plantings dates back to the 11th century. The name Savoie comes from a Latin term meaning the country of fur trees, which this alpine region certainly has plenty of. Savoie was annexed to the French from Torino in Northern Italy in 1860, and some of the architecture still retains an Italian feel. 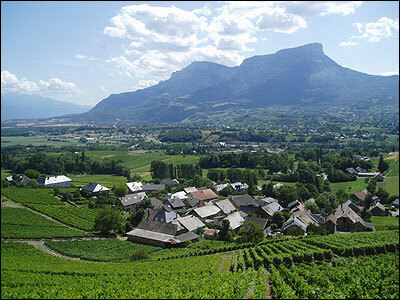 In 1889, there were more than 13,000 ha (32,100 acres) of vines in Savoie. After the phylloxéra, that number dropped to 8,940 acres. Today, the Savoie vineyards only cover about 1,500 ha (3,700 acres). Wine production is small, however. The appellation Corbières in the Languedoc annually produces almost four times as much wine as the entire Savoie! Vin de Savoie is the appellation for all of the villages running the hundred kilometer trek from Lake Geneva to Mont Granier. Crus exist, and are allowed to put their names on the labels. These include Apremont, Chignin, Ripaille and Marin amongst others. ​Surrounding the southern tip of the Bauges moutain range is a cluster of Vin de Savoie producers. This area is at the intersection of three large valleys: La Cluse de Chambéry, la Combe de Savoie, and la Vallée du Grésivaudan. The Chartreuse and Belladonne mountains form the other borders of these valleys. The villages of Apremont and Chignin face each other across la Cluse (or "gorge") de Chambéry on the western side of the Bauges. The soils here combine clay and limestone. ApremontApremont lies at the base of Mont Granier. In November 1248, part of the side of Mount Granier collapsed in a landslide. This destroyed the villages in the area. More than 5,000 people and thousands of animals were killed in an instant. ChigninThe vineyards of the tiny village of Chignin line the side of the mountain beneath the Sommet de Montgelas, planted at about 360 meters elevation. Jacquère is the most important grape variety. Because the vineyards face south and southwest, the grapes become slightly riper and less acidic than Apremont, whose vineyards face east. The Vineyards of Jean-Francois Quénard in Chignin. Around the corner on the eastern side of the Bauges is the valley known as la Combe de Savoie. The Isère river bisects the valley for more than 40 miles northeast to the town of Albertville, host of the 1992 Winter Olympics. The soil in Combe de Savoie vineyards is composed of clay and dark limestone, along with some red, iron rich soil. The subsoil contains many large stones which facilitate drainage. Arbin is a Combe de Savoie village specializing in red wine from the Mondeuse grape. Mondeuse is the red grape of Savoie, as Pinot Noir is to Burgundy or Syrah is to the Northern Rhône. Although many locals claim that Mondeuse is related to Syrah, it appears to be a relative of Gros Syrah, rather than Syrah. Alternatively, other locals claim that Mondeuse Noir is a hybrid of Mondeuse Blanche, a white grape that disappeared decades ago. In the Northern Italian hills of Fruili, it is known as Refosco. Very little Mondeuse is seen outside Bugey and the Savoie. A little is grown in the United States, however, most notably at Au Bon Climat Winery in California. Mondeuse is a varietal that hasn't yet become a household word. One shouldn't hold their breath that one day the Mondeusesection will be located next to the Cabernet section at your local wine merchant! Chances are, however, that it will continue to reside in the "Other France" section — a graveyard for the mainstream but treasure trove for the wine scout. Mondeuse is not a high alcohol grape. Even in hot years like 2003, Mondeuse across Savoie still had difficulty reaching 12% natural alcohol. The juice from Mondeuse is a wonderful beet-colored red. The nose often gives aromas of red fruits and spice, but the mouthfeel often lacks some weight and comes across as being flat and tannic. The challenge is to grow Mondeuse in areas that get the most sun possible, work the vines to help minimize any green and vegetal aromas, and produce a fleshy, fruit-laden texture whose flavors hypothetically blend cru Beaujolais Gamay with Northern Rhône Syrah and just a bit of Cabernet Franc from the Loire. These red wines make an excellent accompaniment to pork roast, veal stew, or sausages with polenta. Of course, the local tomme cheese (or comté for that matter) also pairs marvelously with the grape's deep, intense fruit.